Three spoiled daughters of an arms- manufacturing magnate sing karaoke at their grandmother’s wedding: What is the least feasible outcome? 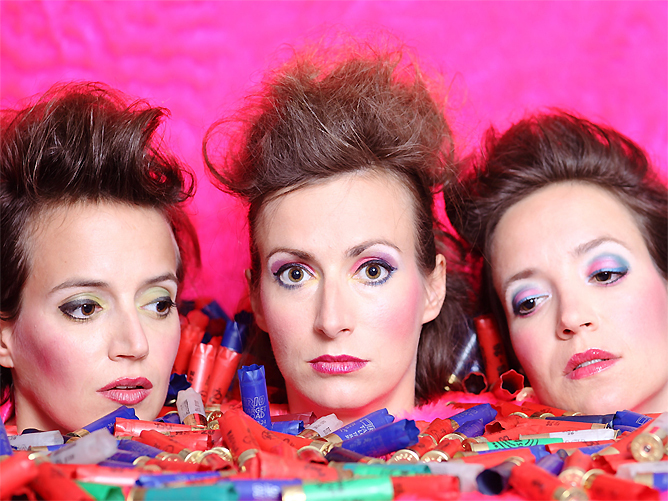 One of the funniest trash-pop-bands since the Riot Grrrls. After having chucked their Swiss-boarding-school-manners overboard, they rather seem to be some waste coming from an atomic power plant than the offspring of an Australian multimillionaire. They’re loud, they’re wild and highly unstable. Their names are Kala Bebe, Bess Brown and Lola Python. Lola is currently working on her PhD in Applied Physics and living on her skills and punches as a platinum-belt-lightweight boxer. Bess ‘Shark Whisperer’ Brown is a fish-trainer for Hollywood B-movies, and as the only film-worthy fish are sharks, her life is a constant endorphin-ride. The audience in any case won’t get bored with the Sawoff Shotgun. They are hard to digest and razor-sharp. The question that remains is not whether but when this bomb is going to explode.